You are here: Home / Money / Business / NFL Viewer Protest; Your Ability is Your Power. 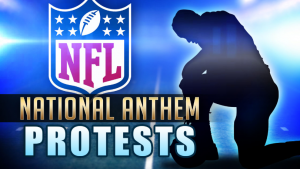 NFL Viewer Protest; Your Ability is Your Power. (ThyBlackMan.com) To some the NFL is something they can discard easily. For them its easy to protest if there are not any family or emotional ties to the game that transcend the gridiron. When I think about the NFL my mind reflects on my late father. I’m a Saints fan because he raised me to be on…football is more than a game to me; it is a space by which my father taught me about life and living. Though I personally have no love for the Dallas Cowboys I know they have fans that have a love for the team that is personal and connected to family. It has been a bit heartbreaking, though I am proud of them, to see those fans cut off the Cowboys because of the stance the owners have taken regarding the National Anthem debacle. In the most of all of this I wonder if the players realize they hold the power in this entire situation. The truth of this is simply…the ability of the players is indeed the power to bring the owners to heel. If players do not suit up…there can be no game. If the Cowboys, and any other team, doesn’t have players well…they simply can’t continue. The players do not have to tolerate subpar treatment at the hands of their employer. So many people have stated the employer can set the rules…and that is true, but if some of the language we’ve heard were used in other jobs spaces we’d be telling employees to sue. If one pays attention to the news every time we see companies faces with racial discord it must be rectified quickly or there is swift repercussion for that behavior. How are NFL teams excluded from said consequences? Why is the players don’t seem to understand who they are in the mist of this madness? Fans don’t fill stadiums to watch owners. They do not buy NFL jerseys with the names of owners on the back. The game is not what it is because the owners are…it is because the players are. This is a microscope whereby black people need to understand who they are and where their power lies. We put a lot of emphasis on buying power and it is important, but its not the only kind of power at our disposal. Our ability physically, artistically, intellectually and innovatively is indeed a kind of power that we must own. We must use this power to force others to realize it is not okay to mistreat us then use us for our ability. Most key positions in the NFL are dominated by black players. What would happen if black quarterbacks, running backs, wide receivers, tight ends, linebackers, defensive linemen, and defensive backs decide they are simply not going to play in Dallas or no where else whereby they are disrespected and devalued as human beings? What would happen if our people took their ability off the table in many areas whereby they are not values? We must begin to see this as a major source of power on the same level with buying power if not more. Please read this. The truth about America. GREAT ARTICLE and SPIN on the NFL National Anthem Conflict! In that article, DeMaurice Smith, the Executive Director of (the National Football League Players Association) NFLPA is finally expressing an interest in solutions to the African American killings. He appears to be attempting to harmoniously bring owners along with him. Wouldn’t it be great, if NFLPA received @ https://twitter.com/NFLPA 1,000 tweets, which he could show to NFL owners, saying the black community supports us (NFLPA) and our efforts to come up with practical solutions to the errant killings of African Americans, by law enforcement and their proxies. Wouldn’t it be great, if we all used our platforms, no matter how small, Mr. Starr, to let NFL PLAYERS, WHO ARE FIGHTING TO FIND SOLUTIONS TO STOP THE KILLINGS, that we stand with them? After all, NFLPA has the financial resources of $90,000,000.00, which owners have offered them, to make any solutions they come up with a reality. Sometimes, BLACK FOLKS ARE ALL TALK AND NO PHYSICAL SUPPORT, WHEN THEIR SUPPORT CAN MAKE A HUGE DIFFERENCE! Read the article and let me know what you think. Maybe I am completely wrong!